Last year, it seemed that Spice and Wolf was the "it" series for the fall of '07. It seemed to have the elements of a groundbreaking work: beautiful, crisp artwork, mature and intelligent characters, all garnished with a hint of the supernatural. 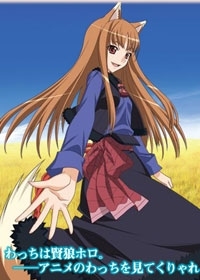 (The main character, Horo, is, after all, a wolf god in anthropomorphic form) Viewers were driven by their curiosity to see where such a subtle and well-researched show would venture. To sum up the setting: near the end of what feels like the Middle Ages, the Church's influence is rapidly spreading, eliminating the Pagan traditions of old and controlling the flow of money. A young but wise merchant named Lawrence discovers a girl with a tail and wolf ears sleeping in the back of his wagon: Horo. After a series of deals are struck, the pair set off to bring good luck to Lawrence's business and return Horo to the forests of the North. Political, romantic and economic drama is set in place, especially since the Church's influence lurks in every town they visit, threatening Lawerence's reputation and Horo's life. Yet somehow, IMAGIN Studio decided that feudalism economics and bartering deserved an anime. Economics aren't just an aspect of the plot: they are the plot. Oh well, the script is excellent, so it's bound to make economics interesting, right? …Right?! No, actually. Not at all, in fact. When you hear dark, ominous chords in an anime's soundtrack, you expect to hear a line like, "they've taken your daughter hostage." In Spice and Wolf, the ominous soundtrack is followed by something like, "The guild has recounted their interest to profit from the recession?! But my stock will decrease in value!" Now, I am a huge fan of anime that goes against the grain, so I won't dismiss Spice and Wolf just because it went way over my head. Like I said before, the animation is fluid and graceful, and Lawrence and Horo are very believable characters that play a subtle power struggle. Between Lawrence's level-headedness and Horo's carefree nature, they make a very charming couple. The soundtrack will surely earn its place as containing the most Renaissance Faire-friendly sounds in anime history. If you can stomach entire episodes of Economics 101 and gradual, snail-paced character development, then give it a view. Just expect a cliff-hanger ending, because the 13-episode season hasn't covered the entirety of the original novel.